Anytime I travel somewhere, I can never resist a little bit of shopping. St.Barths has quite diverse shops from high end to local boutiques filled with one-of-the-kind gems. 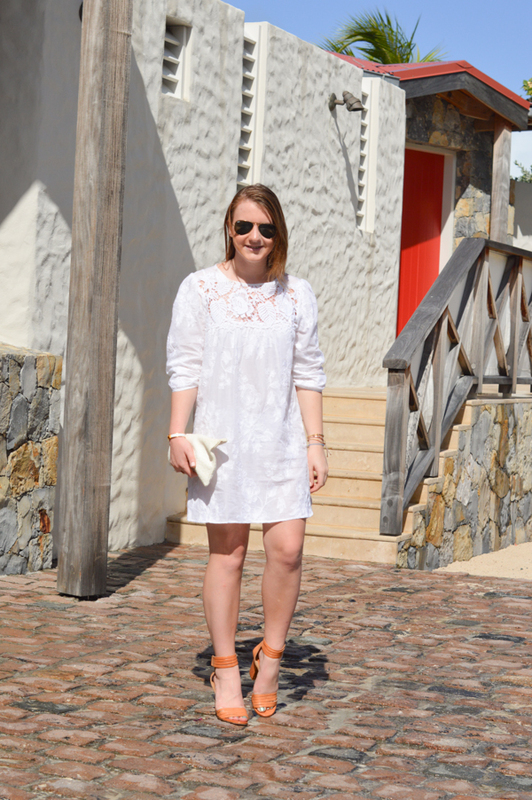 Before my trip, I was on a hunt for a white lace dress that was a little more causal and to be cliche- me. One of my favorite boutiques, Lilli Belle carries a plethora of white lace dresses. In the end I chose this one partially because it was something I've never seen before. And truth be told, it reminds me of a hippie child and the Sound of Music. Sometimes finding a special piece is all it takes to elevate your wardrobe. What a great outfit for nice, warm weather! I wish I was somewhere like that, Washington gets really cold during the winter. Love this look Sloane! I love the white dress with the white clutch and the neutral shoes. So adorable!